Used to create, update or replace a DataWedge Profile and its settings, and can configure multiple Plug-ins with a single intent action. This API implements nested bundles, which contain multiple configuration parameters in a single data field. To create a Profile without configuring its settings parameters, use CREATE_PROFILE. DataWedge 7.1 - New configuration for: full profile (all plugins, APP_LIST, and Data Capture Plus), Data Capture Plus, IP (Internet Protocol), MSR (Magnetic Stripe Reader), Simulscan. New SEND_RESULT result code for multiple plugins. DataWedge 7.2 - Added new DotCode decoder support. PROFILE_ENABLED [String]: Optional; Controls whether to enable (true) or disable (false) a Profile (default=true). If not specified, no change is made to the Profile state. Plug-in names are case sensitive. For DataWedge 6.5 and below, each intent involving a Plug-in requires a separate intent Action. See tables below for PARAM_LIST values. 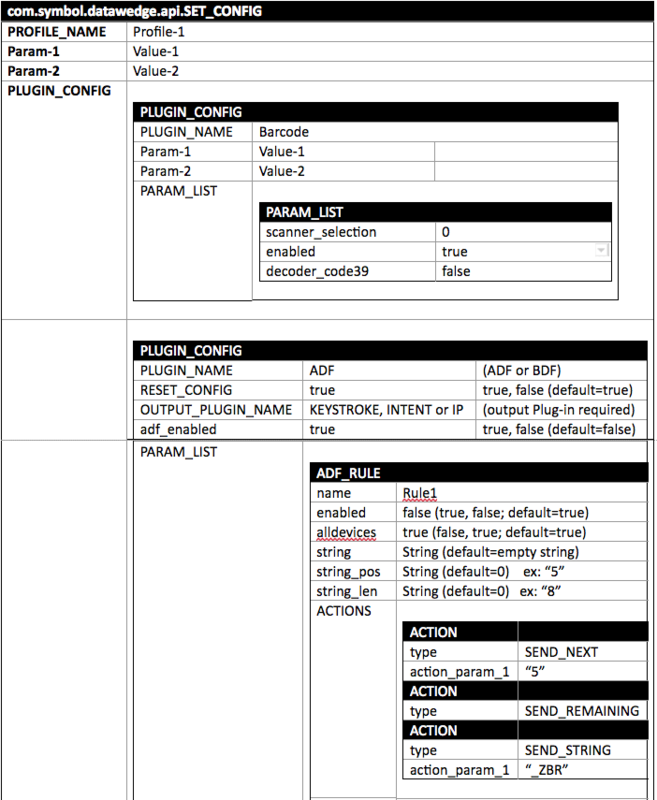 PARAM_LIST [Bundle]: A parameter list bundle nested within the PLUGIN_CONFIG bundle. Includes the list of parameters to be updated under the specified Plug-in. Setting an empty string in any parameter value resets that parameter to its default setting. A visual representation of nested SET_CONFIG bundles. See example code. The PARAM_LIST bundle is configured by specifying the parameter name and value from the table below. Applies to parameters matching the PLUGIN_NAME specified in PLUGIN_CONFIG bundle. 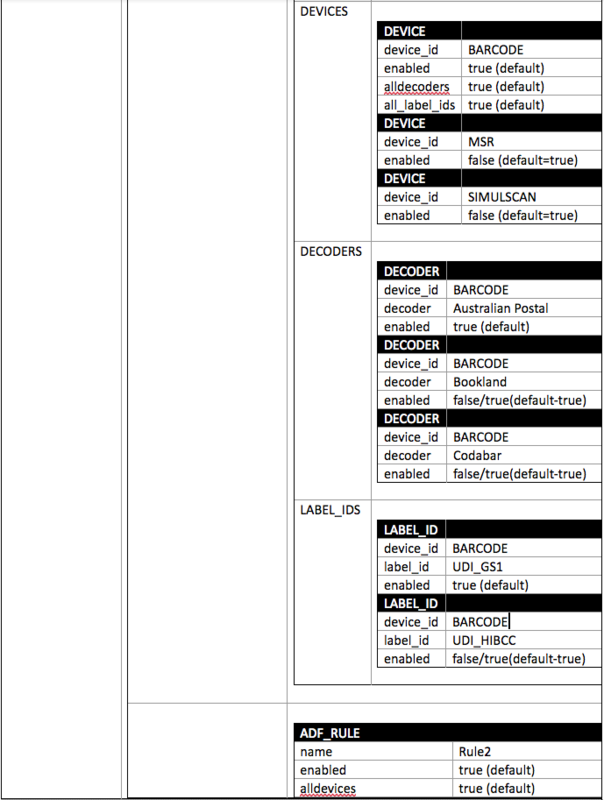 BARCODE – takes a value from the Scanner Input Parameters table below; specify decoder and other input settings as EXTRA_DATA in the PARAM_LIST nested bundle. scanner_selection_by_identifier [string]- takes a value from the list of Scanner Identifiers below. If set to “true”, the parameter scanner_selection_by_identifier is ignored and the configuration is saved as a Global Scanner Configuration. If there is any previous configuration for any individual scanners, they will be replaced with the new global configuration. If set to "false", the configuration will be saved for the individual selected scanner only. In the event the scanner selection is set to “Auto”, the current default scanner configuration is updated. KEYSTROKE - takes a value from the Keystroke Output Parameters table below; specify output settings as EXTRA_DATA in the PARAM_LIST nested bundle. If a Profile is created without at least one Rule, DataWedge creates a "Rule0" with a single action to "SEND_REMAINING" data without modification. If values in one or more newly created Rules are missing or invalid, DataWedge uses default values. To update one or more Actions in an existing Profile using an intent, all Actions in the Profile must be included in the intent. Known as "Send pause" in the DataWedge UI, pauses the specified number of milliseconds (default = 0; max. = 120000) before executing the next action. Zebra recommends pausing 50 ms after sending any ENTER, LINE FEED or TAB character. Default action_param values are 0, empty or none unless otherwise noted. To help minimize data loss, Zebra recommends sending a DELAY of 50 ms after sending any ENTER, LINE FEED or TAB character. An array of bundles that contains a set of PACKAGE_NAMES and an ACTIVITY_LIST to be associated with the Profile. ACTIVITY_LIST [List]: A list of activities for the PACKAGE_NAME. Wildcard (*) character also supported. The scanner identifier (introduced in DataWedge 6.5) permits scanners to be identified by a friendly name rather than an index number. SCANNER_IDENTIFIER [String]: Present in each scanner info bundle for each scanner supported in the device. Index and identifier parameters are both supported in DataWedge and higher; the scanner identifier value takes precedence if an index also is referenced in the code. Important: Support for decode parameters can vary depending on the selected scanning device. For device-specific support notes, please refer to the Integrator Guide that accompanied the unit. All parameters are case sensitive. decode_screen_time Length of time (in milliseconds) to display the screen notification upon successful decode. Important: Support for serial parameters varies by device. For device-specific support notes, please refer to the Integrator Guide that accompanied the unit. dcp_highest_pos 0-100 Sets a ceiling for button position expressed as a percentage of total screen height. For example, on a screen measuring four inches vertically, a setting of 75 (%) would prevent the upper edge of the DCP button from being positioned less than one inch from the top of the screen. dcp_lowest_pos 0-100 Sets a floor for button position expressed as a percentage of total screen height. For example, on a screen measuring four inches vertically, a setting of 25 (%) would prevent the lower edge of the DCP button from being positioned less than one inch from the bottom of the screen. dcp_drag_detect_time 0-1000 Wait time (in ms) that DCP should wait after a screen tap before triggering a scanner action. This can help prevent accidental triggers when dragging the DCP button to a new location. The keystroke_delay_extended_ascii parameter is deprecated. If a Keystroke Plug-in bundle uses the keystroke_delay_extended_ascii parameter, DataWedge sets the keystroke_delay_multibyte_chars_only parameter to true. The keystroke_character_delay value is retained. The keystroke_delay_extended_ascii value is ignored. If available, the keystroke_delay_multibyte_chars_only value is saved; it is otherwise considered false. Applicable for UDI or multibarcodes. * DataWedge determines the priority order according to the order of items listed in the ArrayList, with Element 0 having the highest priority. bMain.putString("CONFIG_MODE","CREATE_IF_NOT_EXIST");   // <- or created if necessary. // using the ENUMERATE_SCANNERS API. // NEST THE BUNDLE "bParams" WITHIN THE BUNDLE "bConfig"
// THEN NEST THE "bConfig" BUNDLE WITHIN THE MAIN BUNDLE "bMain"
Process Plug-ins manipulate the acquired data in a specified way before sending it to the associated app via the Output Plug-in. About BDF. About ADF. Note: This generic code must be modified to match the API being used. Support started with DataWedge 7.1. Previous DataWedge versions required multiple intent calls to set configuration for multiple modules (plugins, APP_LIST, and Data Capture Plus).